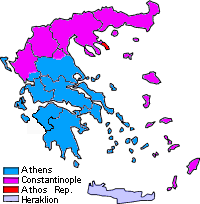 The structure of the Church of Greece is unique in that it does not included all the area of the nation of Greece within its jurisdiction. The Orthodox ecclesiastical structure in the nation of Greece reflects the secular political actions during the formation of the nation of Greece beginning from its establishment in the second decade of the nineteenth century. The Church of Greece was formed after a portion of the present day nation won its independence from the Ottoman empire in the 1820s and received autocephalous status from the Church of Constantinople in the mid 1800s. This area included the southern part of the peninsula of Greece consisting mainly of the Peloponnese peninsula and included Athens and Attica and some of the Greek islands. Following the Balkan Wars in the first decades of the twentieth century, Greece grew, adding to the nation of Greece the territories in Epirus, Macedonia, and Thrace, referred to as the New Lands, many of the islands in the Aegean Sea, and the island of Crete. However, ecclesiastical jurisdiction over most of these territories remained with the Church of Constantinople. Following World War II, the Dodecanese Islands in the southern part of the Aegean Sea also became part of the nation of Greece but ecclesiastically remained under the jurisdiction of the Church of Constantinople. that part, Crete and the Dodecanese Islands, that is fully under the jurisdiction and administration of the Ecumenical Patriarchate. This page was last edited on August 20, 2012, at 20:14. This page has been accessed 43,591 times.